When a megayacht builder delivers its biggest-ever project, it’s noteworthy. More noteworthy, however, in the case of the Mangusta El Leon, is the broader concept that she represents. The 177-footer (54-meter) expands its reach into long-range displacement yachts that still stay true to the swift spirit of its long-popular maxi opens. Mangusta has delivered more than 100 megayachts measuring 98 feet (30 meters) and up. All but four of those have been maxis. The four, including El Leon, belong to the Mangusta GranSport series, initiated in 2015. 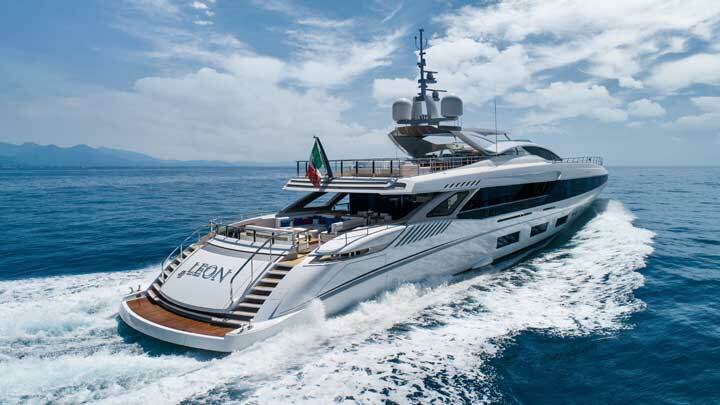 Interestingly, the owner of El Leon is a repeat Mangusta maxi buyer. He became the first Mangusta GranSport 54 buyer in 2016 because he wanted to pursue some long-range trips. Furthermore, he appreciated how the new series preserved the family feel that his previous yachts reflected. The fast-displacement hull design is by PierLuigi Ausonio. To be more specific, she has what the builder calls a fast surface piercing hull. Briefly, her bulbous bow pierces the water’s surface without planing. 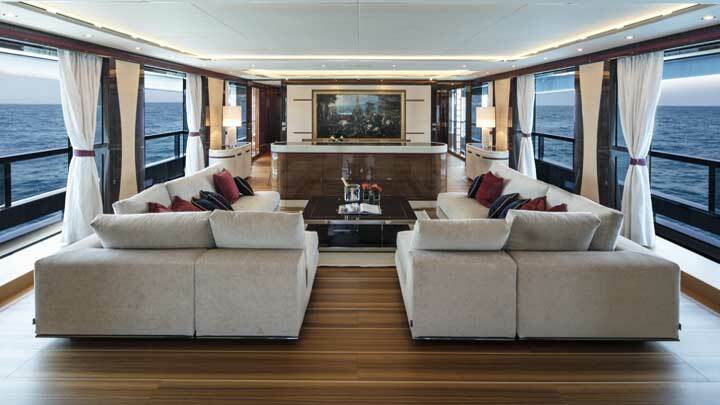 In addition, the yacht remains in displacement mode at higher speeds than traditional displacement yachts. All the while, the hull reduces hydrodynamic resistance. Furthermore, El Leon has four MTU engines, producing 2,600 horsepower apiece, somewhat less than similarly fast yachts. Because the owner will relax and work onboard, on short cruises as well as months-long travels, El Leon features a tailored layout. The desk in the main-deck master suits business needs, though the owner did also request a dedicated office. It’s behind a sliding door off the foyer leading here. 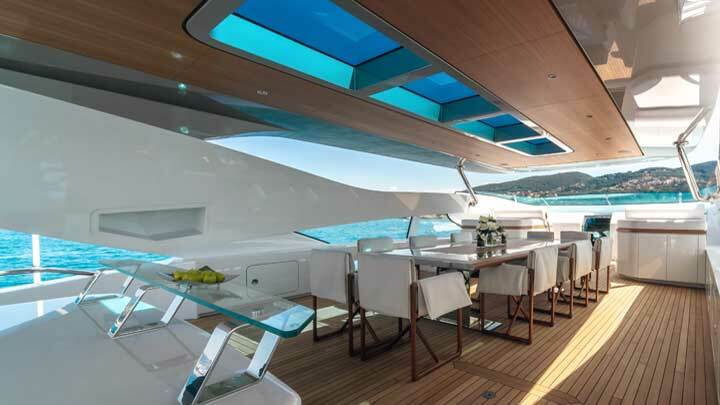 Mangusta’s original concept was for that area to be a breakfast nook. The owner did, however, preserve the fold-down balcony within the master. It suits daytime or nighttime leisure at anchor. Another request by the owner: teak soles inside. The combination of the planking and white seams evokes a traditional maritime feel. Leather, walnut, and ebony, of course, add luxury touches to leisure areas like the saloon and the four guest staterooms below decks. They also characterize the TV lounge below decks. If you’re familiar with Mangusta maxis, you may recall several owners request this lounge, steps from guest staterooms but well soundproofed. 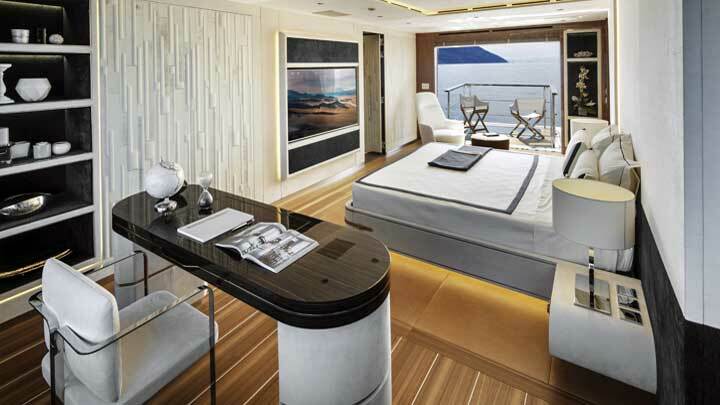 All of this comes aboard a megayacht with more than 2,939 square feet (273 square meters) of alfresco space, too. 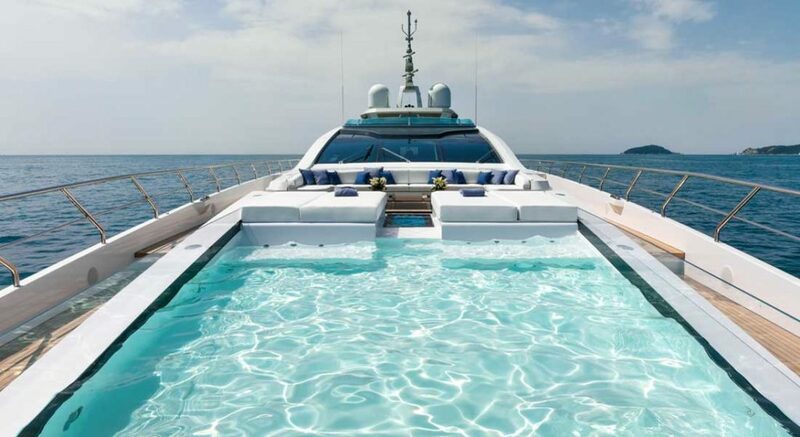 The foredeck infinity pool (top of page), surrounded by sunpads, has hydromassage jets. 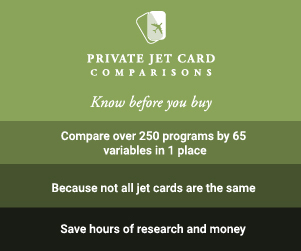 On a related note, it fills in 45 minutes but can empty within five in an emergency, according to Mangusta. Otherwise, emptying takes one hour. Elsewhere, El Leon treats her owner and guests to outdoor dining. 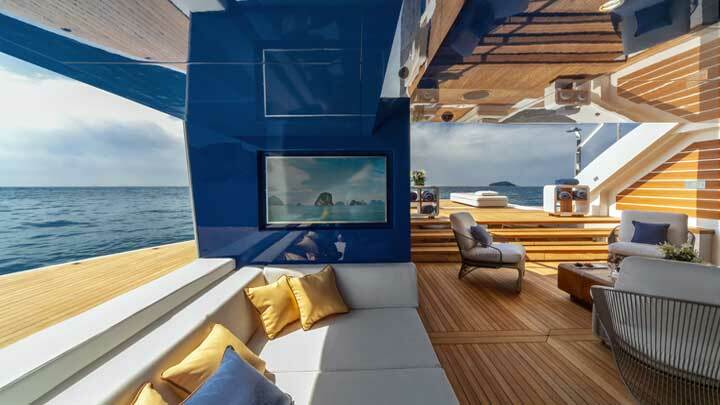 The flying bridge’s table is ideal, somewhat sheltered due to the hardtop and side glass. That hardtop, however, features skylights, for a brighter ambiance. Welcome, too, El Leon has a beach club. Three-sided access puts 753 square feet (70 square meters) of indulgent leisure at everyone’s disposal. Further sunken, down three steps, it’s usable solely at anchor, due to alfresco-only guest access. 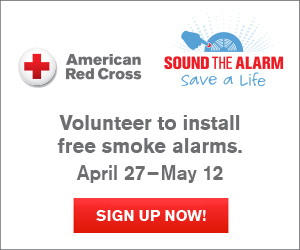 However, the crew can service it from within. 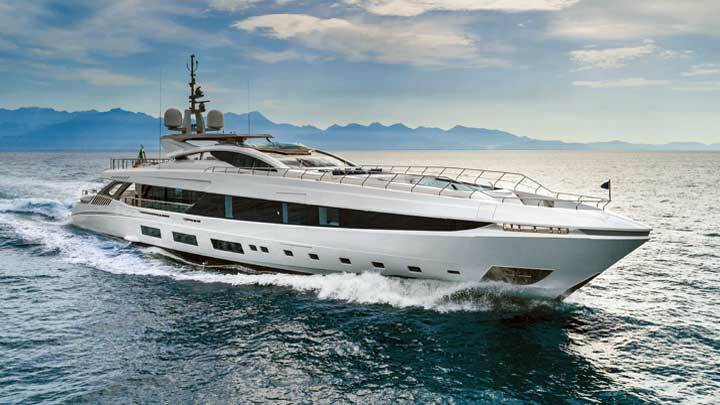 Mangusta’s move into long-range motoryachts is still relatively new. Considering El Leon is the fourth hull in just two years, the move is well received.